Victorian inspired pendant with a little cute pink flower photograph in the middle, on a fine black ball chain necklace. 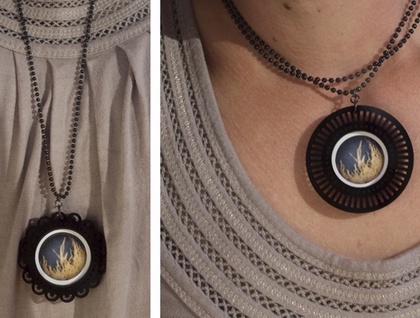 Pendant measures 5.5cm in width, and is lasercut from 3mm thick acrylic. Ball chain necklace is 74cm in length, which can be easily cut to suit, or alternatively worn as a choker by threading the chain back through the main jump ring attached to the pendant (see second image for example). Contact blackswan to enquire about payment or shipping options.